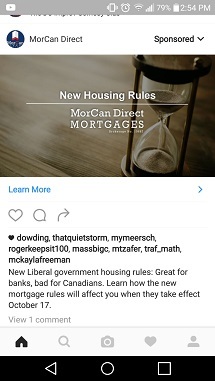 One Toronto brokerage is taking the opportunity to educate potential clients about the recent mortgage rule changes through an ad on the popular social media platform. MorCan Direct, an independent brokerage in Toronto, sees opportunity in change. "Our mission is to provide sound, unbiased mortgage advice; that’s our value proposition," Simon Hanvey, senior underwriter with MorCan Direct, told MortgageBrokerNews.ca. "The new regulations are pretty far reaching, so we've seen a lot of confusion and concern simply within the industry itself. "You can imagine how much more confusing that is for the average homeowner or new buyer that's not in the industry. We look at this as a great opportunity to educate and to reassure." And with the recent changes – which have caused a stir among homeowners and potential buyers alike – MorCan has experienced a slew of calls and emails from concerned Canadians. "A lot of our clients have been in the game for a long time, so they've seen these types of changes before. But they still have questions, particularly when it comes to thinking about their real estate investment portfolios," Hanvey said. "So to those clients, there has been a lot of emails and phone calls walking them through the changes, just providing that steady, reassuring hand." 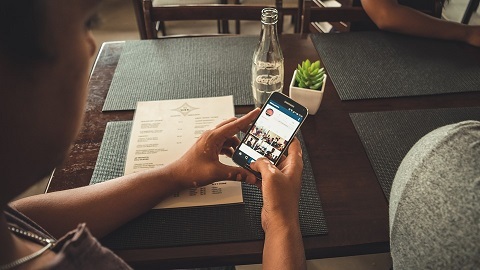 And in a smart bit of marketing, the brokerage has targeted Instagram users – typically Millenials, many of whom may soon be first-time buyers – through an ad that focuses on the changes. "For those new buyers, potential clients, obviously a lot of them are younger, the millennials, so it just makes sense to try to speak to them where they're most engaged - social media," Hanvey said. "And they're the ones dealing everyday with affordability, whether in struggling to rent a place or hoping to buy - so they really have the most at stake with these new changes, and we'll be there to keep guiding them through this market with sound advice." See the sponsored ad below. The ad links to the MorCan website, where all the rule changes are explained. And, of course, potential clients can get into contact with an agent.